The Matanuska-Susitna (Mat-Su) Borough lies northwest of Anchorage, Alaska, and includes the towns of Houston, Wasilla, and Palmer. Locally known as Mat-Su, the borough is roughly the size of West Virginia (over 24,500 square miles) with about 100,000 residents living in it. 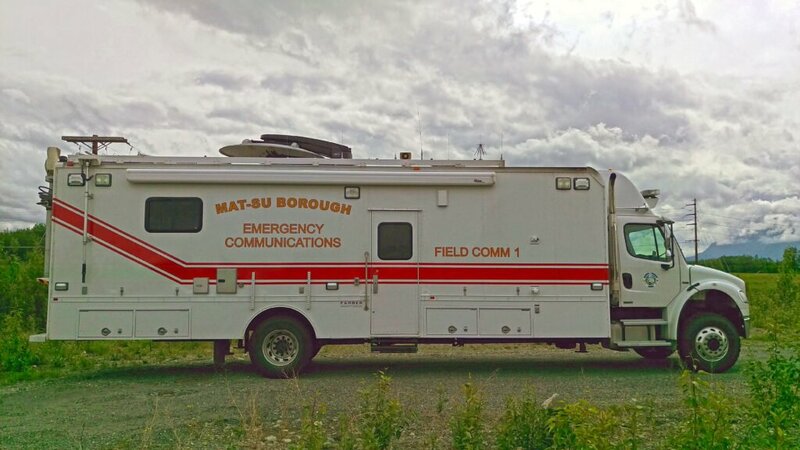 When emergencies and events that draw large crowds occur, the Borough Emergency Management team rolls out this Mobile Communications Center on wheels. 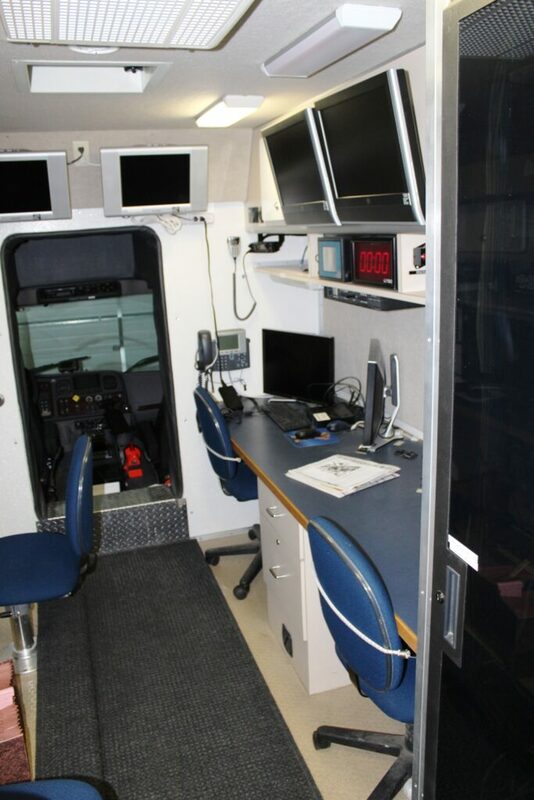 Field Comm 1 (FC1) is a mobile command center that can serve as the central location for emergency personnel to organize, communicate, and plan during an incident. One person can mobilize and set-up the rig on short notice to any incident where it is needed. FC1 is a solid 4×4 truck, built on a 2006 Freightliner chassis with a rugged Mercedes diesel engine. Measuring 42 feet long and 13.5 feet tall, this rig contains a large slide-out section on the driver’s side, a 12-kilowatt generator, exterior power and video ports, exterior floodlights, a rooftop telescoping camera, a public address system, top-mounted observation deck, and a full weather station. 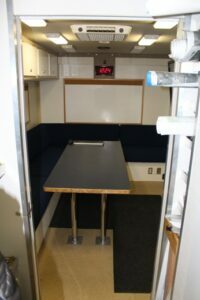 The interior is outfitted with a front computer room with four full workstations, a rear meeting room area with a touchscreen TV and large map table, phones, portable radios, a small incinerator toilet, coffee station, dispatch capabilities, ability to tether into a phone or satellite system, and can tow a matching trailer that treats bulk water for potable use. Eight to ten people can work effectively inside the rig during an incident. This allows for the unique ability for multiple agencies to have a single central on-scene location out of the weather to coordinate logistics and resources. FC1 is dispatched roughly 3-5 days per month for use at incidents, drills and training, and special events. Over the past decade, FC1 has been dispatched for use for incidents including flooding events, wildfires, house fires, search and rescue operations, Iditarod Sled Dog Race starts, the annual State Fair, Alaska Shield exercises, hazmat drills and mass casualty drills relating to the passenger and freight railroad that passes through the borough. This particular rig isn’t necessarily something that RVers want in their garages, but rather it is an excellent example of a purpose-built rig that sees some heavy duty life-saving action. Custom builds like these often draw inspiration from and use commonly found RV features (like slide-outs) that manufacturers incorporate into products for the general public. Nice. – But it would have been nicer if there could have been even more pictures of it both inside and outside of it fully set up and ready for use including with the slide out extended and the observation deck set up and with the crew standing by ready for action. But alas, no such luck. What do they like us to have as an emergency communication device if no cell phone signal and we need help or are lost. What are the options out there that we have to choose from. Many emergency communications vehicles use ham radios, both VHF/UHF and HF. Many hams use digital communications, which are generally more robust than voice when conditions are poor. How much did this vehicle cost?